Psycho Solo Diver – Online Diving Blog and more! » Steak And Lobster On The Cheap! Steak And Lobster On The Cheap! OK guys, it happens to everyone sooner or later! …but you’ve just lost all your money at the race track. By now, if you have been following my lobster hunting advise, you should have seven personal lobsters in your freezer at all times – at least if your luck has held lately. Lobsters in itself have “gourmet” written all over them, so at least you have that part covered! But, how do you present a first class meal at home on an ultra shoestring budget? Take your beer cans to the recycling center and look under your seat cushions for change; that should be good for about $20. Go to your discount grocery store, buy four potatoes and a “Manager’s Special” beef roast – that will set you back about $12, depending on the size of the roast. 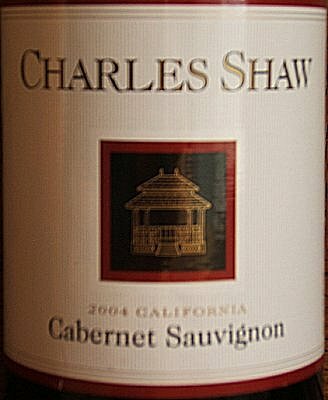 Charles Shaw only costs a couple of dollars, but is actually a spectacular tasting wine that’s won several awards. At home, I am assuming you already have the following staples – milk, butter, fresh garlic or garlic powder, salt and a couple cans of green beans – don’t worry, everyone has canned green beans, for some strange reason or another; eventually most of the time, they get donated after 20 years to a canned food drive. Remember, even though “Manager’s special” meat is a little brown on the outside due to the “aging” process, inside should still be fairly pink. Extra steaks – and you should have several extras – should be frozen for later meals. Boil some water and thaw your frozen lobster tails. Meanwhile, dig in the back of your pantry and find the canned green beans; you may have to dust off some of the cans in the back. By now, your lady has figured out that you are going out of your way to cook a very special meal, so pour her a glass of wine while she waits – a BIG glass of wine. 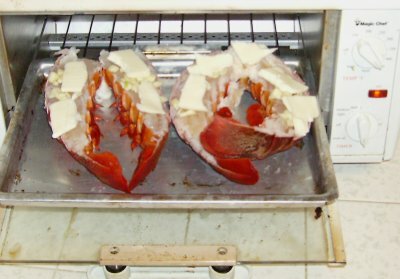 After the frozen lobster tails turn a bit red, they should be thawed enough to cook. 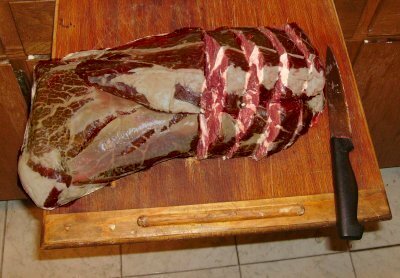 Take them out and slice them down the middle with a seraded butcher’s knife – they should already have been deveined before you froze them. Place them on foil and put butter on top of the halves; cook at 400 to 450 degrees for 10 to 15 minutes, keeping the tops moist with butter all the way through. 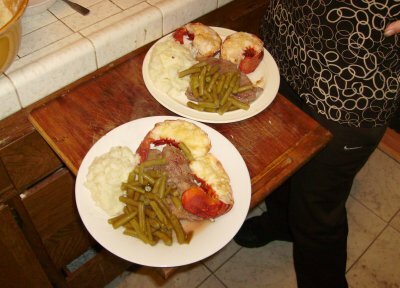 Cooking time depends on the size of the lobster tail; when the meat is white all the way through, it’s done. Place garlic on top at the last five minutes of cooking time. 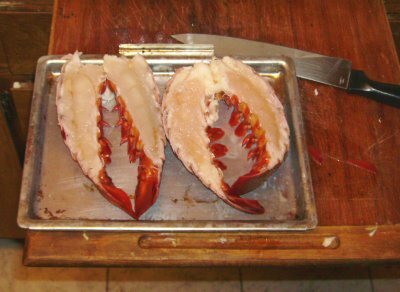 If you undercook lobster meat, it will be chewy, while over done makes it mushy. Peel your potatoes and start boiling them; open your green beans and cook them in water either in a microwave or on the stove top. If you like medium or rare steak, put them on the grill or pan now; if you like them well done, you should have started a few steps ago. By now, your woman is probably complaining that you’re taking too long with dinner; pour her another BIG glass of wine and say that it’s almost ready. With the rest of the meal preparation coming to an end, take the potatoes out of the boiling water – they should be mushy. Mash up the potatoes, adding small amounts of milk and butter, until the desired consistency is achieved. A gourmet meal of such high quality would probably cost $40 a plate in the finest of restaurants! Maybe the presentation isn’t that great, but hey, your woman probably has a pretty good buzz on after drinking a few large glasses of wine on an empty stomach and surely doesn’t care. 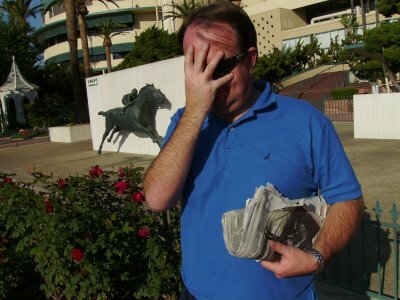 The seemingly extravagant meal with the wine can help explain where all your money went, however, be sure not to leave the Racing Form or track program in the back seat of your car! You’re my hero Jeff! I knew those lobsters would come in handy. Thanks for welcoming me to scuba on my site. Much appreciated. Man, your post made my mouth water. Ha ha. Right on, best advice I have had all week! Who was your dinner date PSD? Pretty damn interesting and informative – and funny, too. Maybe you should just stay away from the track? PRO TIP: You neglected the paragraph where two buck chuck is poured in the empty Beringer bottle- sourced from off property recycling bin obviously.